Discover Puglia with Italy Gay Travels! Discover Puglia! The land of sunshine, beaches, good food and hospitality. People in this area are incredibly friendly and welcoming. Located in the South Eastern tip of the Mediterranean, Puglia is a treasure trove of art, history and nature. Besides discovering some of the most amazing beaches in Europe, Puglia has centuries of history and enchanting landscapes that make this place unique for a trip for unforgettable experiences. With over 800 km of coastline on both the Ionian and Adriatic Sea, you can marvel at the variety of golden beaches. Inland, vast plains and rolling hills dotted with Farmsteads and dreamlike Trulli (ancient conical roof buildings) are surrounded by ancient olive trees and sumptuous vineyards. Puglia also has 3 UNESCO sites: Castel del Monte, the mysterious fortress of Emperor Frederick II, near Andria; the trulli of Alberobello, magical dry stone buildings; and the Sanctuary of St. Michael the Archangel in Monte Sant’Angelo, a medieval masterpiece of art and international pilgrimage. For all the foodies, look no further, the Puglian kitchen is famous all over the world (and even in Italy)! The secret is in the ingredients, fresh local produce such as the excellent extra virgin olive oil, hand-made orecchiette, mouthwatering burrata and fine local wines. 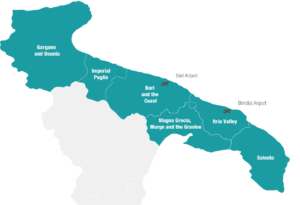 Puglia is divided up roughly into 6 areas, Gargano and Daunia, Imperial Puglia, Bari and the Coast, Magna Grecia, Murge and the Gravine, Itria Valley and Salento. Have a look at what is on offer in each region. Puglia has become such an easy destination to reach from all European capitals thanks to direct flights to Bari and Brindisi as well as a number of sea ferries.